Propaganda Porcelain Vases, Plates, Plaques etc. $630.00 Red Army Drummer, Kiev, 1962-1976, Soviet porcelain figurine in exceptionally desirable condition with both drumsticks completely undamaged and virtually 100% of the original gilding intact. Excellent! View item in a new window. $375.00 Red Army Drummer porcelain figurine, Kiev Experimental Factory, with professionally added 1969 dedication to a high school teacher. Very good condition. $295.00 "Orderly" (Ординарец), porcelain figurine of a Cossack Warrior, Kiev Experimental Ceramic Factory, 1962-1976. Excellent condition. $40.00 Boy Sailor or Soviet Naval Cadet, porcelain figurine by Polonnoe Artistic Ceramics Factory, circa 1960s, attractive image of a youngster playing grown up. Perfect condition. $38.00 Little Boy dressed up in his Father's Boots and Budyonovka (cloth helmet with distinctive pointed top and red star), Polonnoe, circa 1973-1991, a delightful porcelain figurine in excellent condition. $120.00 Little Boy with a Dog (aka "Young Border Guard"), by the Leningrad Lomonosov Porcelain Factory (LFZ), 1960s. This dynamic and perfectly balanced composition in in the best traditions of LFZ. In excellent condition. $55.00 Suvorov Military Academy Marching Drummer, Polonnoe Artistic Ceramics Factory, 1960s. In excellent condition. 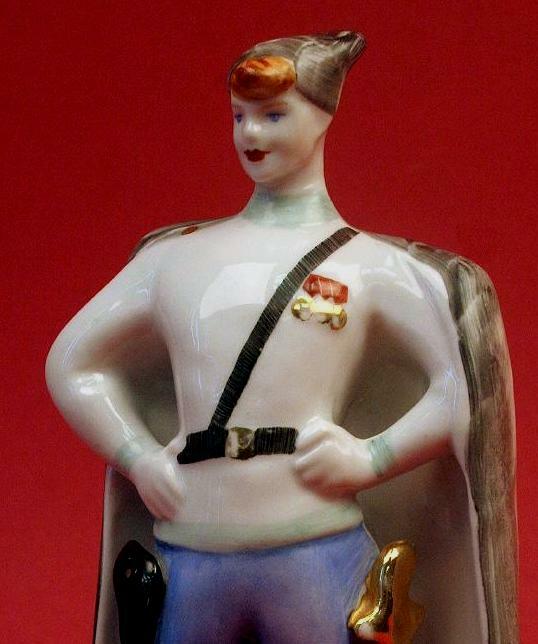 $50.00 Suvorov Military Academy Marching Trumpeter, Polonnoe Artistic Ceramics Factory, 1960s. In excellent condition. $60.00 Suvorov Military Academy Marching Tuba Player, Polonnoe Artistic Ceramics Factory, 1960s. In excellent condition. $345.00 Sadko, one of the most popular characters in Russian folklore, plays his instrument for the Sea Tsar, Kiev Experimental Ceramic Factory, 1976-1991, a dynamically large 12 1/2" Soviet porcelain figurine of the hero standing amongst waves filled with rampant sea life. Excellent condition. $70.00 Tatyutka's Mirror, Sysert', 1968-1977. Porcelain figurine of a little girl and her magic mirror from Bazhov's fairytale. Excellent condition. $95.00 Snow Maiden, Polonnoe, 1956-1973, large and dramatic 11" tall, attractive porcelain figurine of Father Frost's most important helper. Excellent condition. $350.00 Peasant Girl Wearing a Kokoshnik Headdress, a Milk Jug by Natalia Danko, Leningrad Porcelain Factory (aka Lomonosov Porcelain or LFZ), 1950s. Danko was a particularly important - perhaps the most important - Russian porcelain artist in the first part of the Twentieth Century. A superb piece marked "VS" for highest possible quality, and in outstanding condition. $175.00 Sewing Girl, Polonnoe, circa 1973-1991, quite big 9" porcelain figurine captures the perfect essence of a young woman intent upon her sewing or embroidery. Excellent condition. $300.00 Female Plasterer, porcelain statuette, unmarked but likely by Sysert' Ceramic Goods Factory, circa 1960s. $190.00 On the Beach, porcelain figurine by the Leningrad Lomonosov Porcelain Factory (LFZ), 1950s. Nice early example of the "happy childhood" theme, this figurine portrays a toddler boy immersed in studying a shell he just found in the sand. Shows underglaze LFZ maker mark of 1950s model. In excellent condition. $65.00 Zima, porcelain figurine is a humorous version of an overly bundled up kid, "ready" for winter fun, Gorodnitsa, circa 1960s. Very Good to excellent condition. $45.00 Young Girl, a Large Snow Ball, an even Larger Raven, Polonnoe, a curious porcelain figurine colored in an almost "Royal Copenhagen" palette, 1973-1991. Excellent condition. $40.00 Two Children Dressed for Winter Play, Polonnoe, porcelain figurine, 1973-1996. Excellent condition. $55.00 Boy on Skis, Polonnoe, 1951-54, porcelain figurine of a typical boy - skiing cross country in the cold weather with his jacket open and his cap unfastened! Excellent condition. $90.00 Boy with Sled, Polonnoe, 1956-1973, wintertime porcelain figurine. Excellent condition. $30.00 Boy on Rocking Horse, Polonnoe, 1956-1973, delightful porcelain figurine of a youngster at play. Very good condition. $925.00 "Harvest", Collective Farmer / Peasant Girl pen and pencil holder, Lomonosov (LFZ), circa 1950s, very uncommon and hard to locate porcelain figurine of a young woman standing on the edge of a wheat field at harvest time. The perfect embodiment of Socialist Realism! Excellent condition. $195.00 "Harvest", Collective Farmer / Peasant Girl pencil holder, Tselinograd, c 1962-72; a late, simplified rendition of a famous Lomonosov figurine of a young woman at harvest time. A fine example of Socialist Realism! $80.00 Woman Dancer in a Scarlet Dress, delightful porcelain figurine looks like a character from a story by Tolstoy, Korosten, 1955 -1959. Excellent condition. $115.00 Ukrainian Dancer, Korosten, 1955-1962, porcelain figurine of a Slavic Ginger Rogers! Very good to excellent condition. $25.00 Woman Dancer in a Striped Dress, Disney-like porcelain figurine, Gorodnitsa, 1950-1962. Good to very good condition. $75.00 Plump-ish Folk Dancer, Gorodnitsa, 1962-1970, a porcelain figurine with a lot of charm. In excellent condition. $40.00 Balalaika Player & Dancer, known as "Russian Dance" (Русская Пляска), Polonnoe Factory, 1973-1991, porcelain figurine creates a vignette familiar to anyone who has traveled in Western Russia - or simply seen a folk dance troop touring the States. Excellent condition. $19.00 Pair of Dancers, Polonnoe, circa 1973-1991, a delightful and attractive miniature porcelain figurine - only 2 5/8" tall. Petite and charming. Excellent condition. $70.00 Ice Skater, Soviet porcelain figurine, Polonnoe Factory, 1956-1973. Excellent condition. $85.00 Goal Keeper, porcelain figurine of a soccer goalie at work, Polonnoe Factory, 1956-1973. Excellent condition. $90.00 Bikini-clad Bathing Beauty, a rather daring Soviet porcelain figurine, Gorodnitsa Porcelain Factory, 1962-1970. Excellent condition. $295.00 Wood Grouse, Konakovo, 1974-1991, massive 11 ½" porcelain figurine depicts one of the most popular game birds in the Soviet Union. Excellent condition. $55.00 Peasant Fisherman, Polonnoe, 1956-1973, porcelain figurine possibly illustrates a folk tale. Excellent condition. $110.00 "Loves Me or Loves Me Not?" (Girl Deviating on a Flower), Kiev Experimental Ceramic Factory, 1976-1991. A pretty maiden in traditional dress checking her fortune by a time-tested method known to every Russian or Ukrainian girl. Lovely piece in excellent condition, with vibrant colors and free on noticeable wear. This piece by the Kiev Factory is far less common than another statuette on the same subject by the Polonnoe Porcelain Factory. $65.00 Young Ukrainian woman braiding her hair, Polonnoe Factory, 1956-1973, romantic porcelain figurine. Excellent condition. $30.00 Young Russian or Ukrainian woman heading to market, Polonnoe Factory, 1956-1973, porcelain figurine illustrates a weekly event in the countryside. Excellent condition. $70.00 Ukrainian Shepherd & Ram, Polonnoe, 1950s-1960s, stylized, almost Art Deco porcelain figurine. Excellent condition. $145.00 Vakula and a Demon, Kiev Experimental Ceramic Factory, 1962-1976, 8" tall porcelain figurine shows one of the most dramatic (and humorous) scenes in Tchaikovsky's comic opera "Vakula the Smith". Excellent condition. $29.00 May Night romantic porcelain figurine, Polonnoe, 1960s, the Cossack Levko and his girl friend (two main characters from Gogol's "May Night or the Drowned Maiden," the third tale in his "Evenings on a Farm Near Dikanka"). Very good condition. $125.00 Alexander Pushkin leans dramatically against a St. Petersburg iron railing, from an unknown factory, circa 1940s-1950s, bisque porcelain figurine offers a very good likeness of Russia's foremost poet. $75.00 Young Pushkin composing poetry at a table, Lomonosov (LFZ), circa 1950s, a delightful porcelain figurine of Russia's foremost poet. Very good condition. $40.00 Lion Cub (Lvyonok), an adorable feline figurine by the Leningrad Porcelain Factory (Lomonosov, LFZ), circa 1960s. Excellent condition. $45.00 Poodle (Pudel), an eye-catching canine figurine from the Leningrad Porcelain Factory (Lomonosov, LFZ), circa 1960s, 6 ½" height. Excellent condition. $16.00 Rooster salt shaker in porcelain, attractive, image(1960s-1970s)- modern, but still true to its folk art roots. Unmarked but probably a Polonnoe product. Very good to excellent condition. $18.00 Folk Art Chicken kitchen container for spices in porcelain, Polonnoe, 1973-1991. Excellent condition. $49.00 Rooster and Snail Porcelain Vase (or pen and pencil holder), Gorodnitsa Porcelain Factory, 1962-1970, perfect item for a country kitchen! 5 5/8" tall. $35.00 "Fish", a delightful holder for smaller kitchen utensils (wooden spoons, whisks, etc.) that evokes memories of all those talking fish in Russian folk tales, Korosten, circa 1955-1962. Alternatively: the perfect pen & pencil holder for a fisherman! $450.00 Bust of Mikhail Kalinin, by the Lomonosovskiy Porcelain Factory in Leningrad (LFZ), circa late 1940s. Very large size, approx. 13" tall likeness of one of the original Bolshivik leaders, a rare survivor of the Stalin's purges and the nominal head of state of the Soviet Union from 1919 to 1946. Original artwork was created by the acclaimed Soviet sculptor Matvei Manizer. An extremely uncommon, high quality piece in very good condition. See other porcelain statuettes of Soviet leaders in the "Portraits of Soviet Premiers" section of our website. $95.00 Lenin in Grade School, Leningrad Porcelain Factory (LFZ or Lomonosov), 1950s-1960s. Porcelain figurine shows excellent execution and is a very good likeness. Excellent condition. $195.00 Nikolai Nekrasov Bust in Bisque Porcelain, Leningrad Porcelain Factory (Lomonosov, LFZ), 1960s. Collect Russia © 2004-2019, All Rights Reserved.